Slow Roasted Salmon Grilled on a Cedar Plank - Won't Dry Out! I love the flavor of grilled salmon, but don’t love when it’s overcooked. The solution is slow roasted salmon, protected by a cedar plank, and grilled at a lower temperature. There was a clickbait food site article I read recently about “10 Foods You Should NEVER Cook on a Grill”. Naturally, I was curious what I’ve been doing wrong all these years. Some of them were pretty obvious, like grilling pizza. Others, like burgers and shish kebabs, I questioned, because there’s are unique flavors that come from smoke and direct flame. And then others, like grilling salmon (and most flaky fishes), made a lot of sense because of what hot, direct heat will do to destroy a nice piece of fish. It’s really a question of technique though. The standard approach of turning all burners to High, lighting the flame and waiting for maximum heat before cooking will have to be adjusted. And despite how much you clean your grill grates and how much you try to oil them down, having a significant percentage of the fish stuck to the grates is nearly unavoidable. This cedar plank salmon recipe should apply to any type of grilled fish as well. Here’s where we get to how you’ll cook the cedar plank salmon. There are three big changes to make in how you grill salmon versus how you might grill steaks. First, you need to protect the fish from the direct flames. I do this by cooking it on a cedar plank. The cedar plank provides a nice bit of insulation from the burners and it also imparts a subtle woodsy flavor to your salmon. If you are also in the camp that doesn’t like the salmon skin, there’s an advantage that it usually sticks to the wood and separates easily. If you’re a fan of the skin, you’ll want to cook the salmon upside down. Second, we’re going to cook over indirect heat. 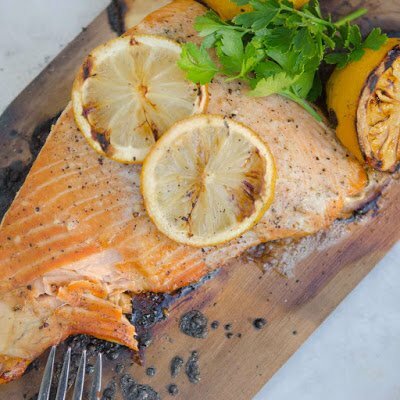 You’ll want to place the cedar plank salmon parallel to your burner elements below the grate on one end of the grill, not in the middle. Whichever burner it covers will be the one you do not use. This causes the heat to circulate inside of your grill and cook the food more evenly. However, if you want to increase the smokey flavor of the grilled salmon, apply a small amount of heat to the cedar plank so that it smolders lightly (but doesn’t ignite). Last, you need a low temperature between 275 and 300 degrees. If you have a thermometer on the lid of your grill, get a second opinion as they tend to be as accurate as a Nerf gun. The best bet is one of the inexpensive Bluetooth grill probes that will wirelessly send data to your phone and can alert you if it exceeds a high point. The amount of time you cook the grilled salmon is going to vary, so you need to pay close attention. For thicker pieces of salmon, such as an Atlantic salmon, the times will be longer than an Alaskan Sockeye which can be half as thick and much leaner. You’ll slow roast the cedar plank salmon for anywhere from 20 to 30 minutes depending on if you want a rarer or more medium well finish. I’ve grilled a lot of salmon over high heat in the past. Something in the 400-500 degree ranges for anywhere from 7 to 10 minutes. And the results are almost always the same. Crispy on the outside, dry and the middle and a layer of white foam instead of a nice pink color. So what is that white foam that oozes out of cooked salmon? I assumed it was the fats, Omega 3’s or something similar that was expelled at high temperatures. Turns out it’s a protein called albumin that lives in the muscle fibers. While it isn’t necessarily a lubricating fat, it is still a visual indication that you will have a dry piece of salmon. In some ways, it’s unavoidable. At an internal temperature of around 150 degrees, the albumin is going to come out. By cooking the salmon slower, you minimize this from happening. If you still want a nice crispy outside, similar to what you achieve by searing salmon in a scorching hot pan, you can do two things. One is to raise the temperature of your grill in the latter stages of cooking. Another is to place the fish under the broiler for a few minutes. Factor this into your total cooking time though. If you’ll be doing 3-5 minutes under the broiler, then pull the salmon 3-5 minutes early from the grill. Right before grilling, I like to baste the fish with an herbed melted butter and then once more about half way through cooking. This is another layer of moisture to help prevent drying out and boost flavor. My go-to is melted butter with a little olive oil, chopped dill and salt and pepper. How about some grilled lemon or onions as well? Since you’ll have your cedar planked salmon on one part of the grill, and all of the open flame burners exposed, you might as well take advantage of them. I like to halve a few lemons and put them over the direct flames. Once the grilled lemons develop a nice char on the surface, move them over to the cedar plank to continue cooking them. The same goes for some thick onion slices. Slow Roasted Salmon that won't dry out on the grill. Melt the butter gently in a microwave. Add the olive oil and about 1 Tablespoon of the fresh chives. Baste the salmon before putting it on the grill and reserve enough to do so again halfway through. On a grill preheated to 275 degrees, place the cedar plank over an inactive burner and cook using indirect heat for about 20 minutes (medium rare) to about 30 minutes (for medium to medium well). Cooking times will vary based on the thickness and variation in your grill's temperature. Optional: cut a lemon in half and cook it over the active burners to develop a charred surface. Move them to the cedar plank after they have charred to your liking. Optional: remove the salmon from the grill 3-5 minutes early and finish it under a broiler if you would like a crispier texture. Now I know why my salmon always dries out and gets that weird white stuff. This was a great way to grill it instead!!! Thank you!!! !